One of the first things I remember noticing about the city of Leiden after moving here to study a Research Masters degree a year and a half ago was that a lot of buildings had poems in various languages painted in their walls. I loved finding them and reading the ones that I could understand, especially the ones in Spanish (my mother tongue) by authors that I knew like Pablo Neruda or Octavio Paz, or just appreciating the beauty of scriptures foreign to me like Arabic, Japanese or Cyrillic. Even today I still enjoy discovering new ones or running into familiar ones (I even live very close to one!). The Muurgedichten (Wall poems) is an artistic and literary project that started in Leiden in 1992. Aquí, by Mexican poet Octavio Paz, in Zonneveldstraat 18 (Anushka Minnaard, Muurgedichten Leiden). I wanted to discover more about why and how did all of these poems end up on the walls of the city, so at the time I did a quick online search and found that the project Dicht op de muur (literally: ‘close to the wall / poem on the wall’) was conceived by Ben Walenkamp and Jan Willem Bruins in 1992, who together with other poetry lovers from Leiden constituted the Tegen-Beeld Foundation, which is still responsible for the wall poems. The aim of the project is to acquaint the people with literature and poetry from different cultures and to “arouse a feeling of respect for other cultures”. The multiculturality of the wall poems also works as a way of celebrating the strong connection between Leiden and world languages, as the project has collaborated over the years with Leiden University and its Centre for Linguistics, where a great deal of the world’s languages are studied. Scattered throughout Leiden there are more than 120 poems in 38 different languages beautifully painted in various walls. Pictured here is Like a polar winter… by Palestinian-Iraqi poet Jabra Ibrahim Jabra in Berlagestraat 13a (Biccie, Wikimedia Commons). More recently, while preparing this post, I found that last October the Tegen-Beeld Foundation together with the Taalmuseum launched a new interactive webpage about the wall poem project, in which each one of the more than 120 wall poems has its own page where you can read the original version as well as translations in Dutch, English and sometimes other languages. Some also have the option to listen to them being recited in their original language and contain additional information about the poem and its author, as well as personal anecdotes and city stories. Fun Fact: Inspired by the wall poems, there is also a project of wall formulas, where 6 famous physics formulas that are somehow related to the city of Leiden decorate some of its walls. The Muurgedichten webpage also offers walking and cycling routes that take you through poems about certain themes like ‘nature’, ‘innovators’ or ‘liberty’, which I think it’s an excellent way to get to discover both the intricate streets and alleys of the historical centre of Leiden as well as some suburban parts of the city. The walking and cycling routes through some of the wall poems in Leiden are an excellent way to explore the city (Muurgedichten Leiden-Google Maps). How many wall poems have you seen? Which one is your favourite? This is so interesting, I’m going to look out for more of them on my spring walks! 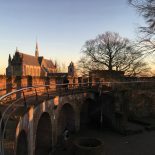 This entry was posted on February 7, 2019 by Daniel Salinas in Culture, Daniel, How to choose your study, Leiden, Living in Holland, Local Customs, Student City, Student Life.